For E2L students aged 16-18 who are planning to go on to study at an English-medium university. Steps to Academic Writing is aimed at students of English especially as a second language who are planning to go on to study at an English-medium university or onto professional training. Designed for classroom use and independent study, it will help students make the transition from the way they have been learning and using English at college to the approach expected at university. 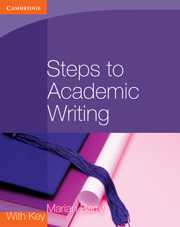 Steps to Academic Writing will help students develop their academic writing skills and express themselves in a mature and appropriate way that is relevant to the context, whether it be a report, essay or other form of writing. Students are encouraged to aim for a reasonably formal, impersonal tone and register, and to develop more independent and abstract thinking skills in English. This material is recommended by Cambridge International Examinations in the resource list for Cambridge International AS Level English Language. Recommended by Cambridge International Examinations in the resource list for Cambridge International AS Level English Language. Eight topic-based units focusing on essay-writing skills, report writing, describing visual information and writing CVs and personal statements for university applications. Removable answer key is provided with answers to all the language questions and a selection of model answers to longer writing tasks. Writing skills are built gradually within each unit through a variety of lively exercises, designed to appeal to students. Typical exercises include brainstorming ideas, planning a structure, writing introductions and conclusions, and writing to different of models. Attention is also given to the micro-skills of spelling, punctuation and vocabularly.